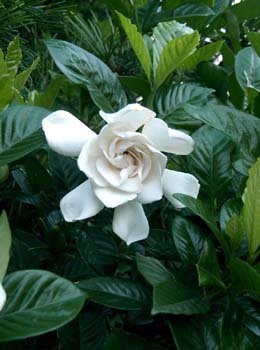 (Cape jasmine; Zhi zi) Wonderfully scented white flowers used by the floral industry in arrangements and corsages. Flowers used to flavour Chinese tea and a source of important essential oil used in perfumery. Fruits are used in Chinese medicine for fever, high blood pressure, insomnia, hepatitis and for sprains, swellings and bruises. Evergreen shrub up to 2m/6ft high with dark green, leathery leaves. Seeds should be soaked for 24 hours before sowing. Germination best at 20-25C/70-80F. Succeeds as a house plant if kept moist and warm (above 18°C/65°F).